I haven’t done a Foodless Friday in a long time now…feels nice to do one after such a gap! Watching: Be Your Shoeself by Wendy Nguyen of the fabulous blog Wendy’s Lookbook. I am a big fan of stop-motion animation; and this one combines it with fashion and a simple but heartwarming message. Reading: Where’d You Go, Bernadette by Maria Semple. I bought this book earlier after reading some great reviews, and I am very happy that I did! A hilarious story about an eccentric mother, a tech-nerd father and their gifted and sassy daughter, with some humorous and sometimes snarky observations about the city of Seattle. The heroine of the novel, Bernadette Fox is a genius architect who wins a impressive grant…only to move to Seattle, retreat into her own quirky shell, and then disappear altogether. Listening to: 10 Million Slaves by Otis Taylor, OST Public Enemies. Wondering: As one gets older, do birthdays become less of a big deal? Do you dread them? Or do you still get excited and do something special? 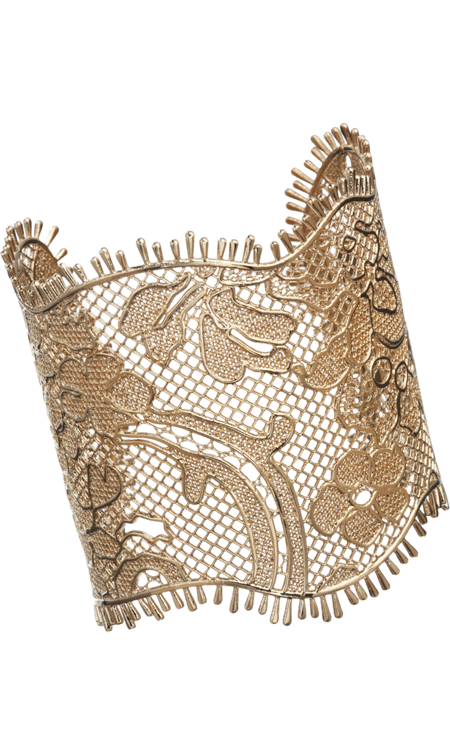 Loving: This lace cuff by Ricardo Tisci. When I was a child, I remember my mother having this chunky silver cuff with rounded edges, with beautiful and intricate filigree work. I don’t know where that went, and have always looked for something similar at jewellery stores. Never did find anything like it. I may not be able to buy Givenchy’s version, but at least I can ask a jeweller for something similar! I LOVE birthdays! normally I make such a big deal fo them, and my mum is the same. this year, I don’t feel too much like celebrating, but I’m sure my friends here will get me out to enjoy it and there’ll definitely be cake! I’m with Heather – party like your five (or in my case with a bunch of 5 year olds in school!) Love the shoe video – although it made me feel really guilty about my avoidance of flat shoes! I started feeling sorry for the shoes – this is the state I’m in today! ridiculous! What a beautiful video! Birthdays should be a big deal. Even if you’re all by your lonesome. Bake a cake, open a bottle of wine, order whatever food you like! Ohhhhhh. that cuff is BEAUTIFUL!!!! Seriously gorgeous. Birthdays are still a big deal for everyone in my family. We are kind of ridiculous. Like my mom turned 57 this year and we had balloons and a song and I made huge brownie sundaes. We celebrate like that for everyone. Party like you’re five!! !